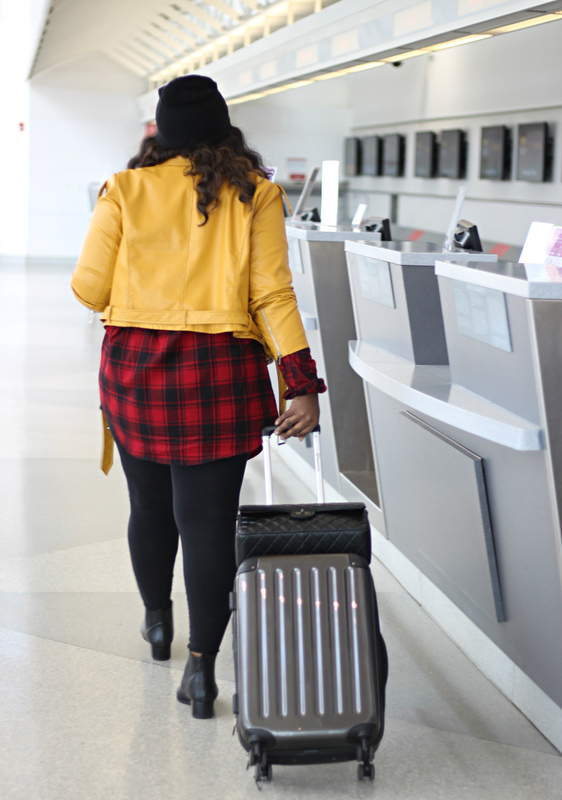 Hi, Chicsters going home for the holidays we’ve got you? 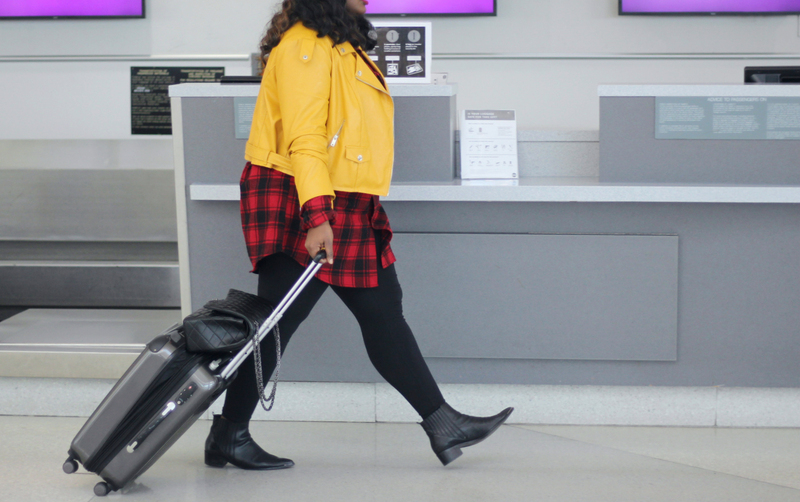 In today’s post ill be sharing an easy travel outfit plus seven mistakes not make if you want to make holiday travel less stressful! If you plan on taking any modes of transportation aside from your own you want to avoid these mistakes like a plague, that is until we can afford our own private Jets. NOT telling your bank you are traveling this is important particularly if you are going out of the country or if you plan to purchase big-ticket items. Regardless take this precaution to save your self stress, especially if your bank is anything like mine (ends with “argo”) where they will block a transaction in an instant if it looks funny at all! Check recheck check your reservations then print them out! I did not realize how important this was until I was on my way to Paris and realized I was about to be homeless cause my reservations were canceled (due to mistake number two)! Why print? sometimes technology isn’t your friend have a hard copy so you have everything you need at your fingertips! Traveling during the day: When you travel during off-peak hours aka night time it saves you time simply because, most people travel during the day, there are shorter lines at night, there is less congestion, facilities are usually cleaner and the best part you can sleep through your journey! Not Planning your transportation, one of the hidden costs of travel is getting from place to place, these costs tend to rack up if you don’t research the best ways to get around! Another mistake we often make when going home for the holidays is leaving your transportation to others aka your relatives it can be soo frustrating. Because there itinerary and yours may not work you’ll be stuck waiting, or depending on their kindness. Not securing your liquids, that moment when you open your luggage and your makeup is everywhere and you are frantically trying to find a dry cleaner to see if you can get the stain out of your dress! Make sure at the minimum your liquids are packed in there own separate pouch and if you are like me two pouches!! Underestimating the time it takes to get to your mode of transport, with increased security nowadays and airports becoming malls as well as terminals. You really need to come to terms with the fact that it can take up to an hour to get to your gate from the check-in desk. If you aren’t flying don’t think this is specific to airports train stations can be just as big as well! 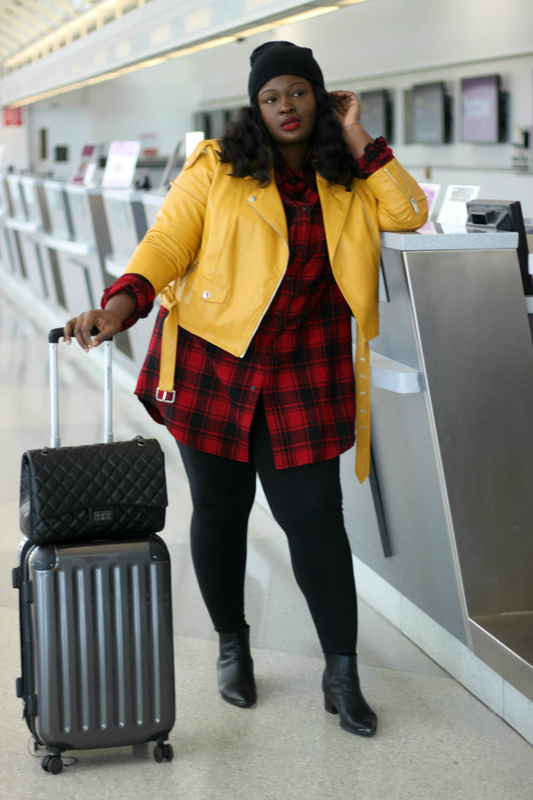 When I think about what to wear for travel two words always come to mind layers and comfort! 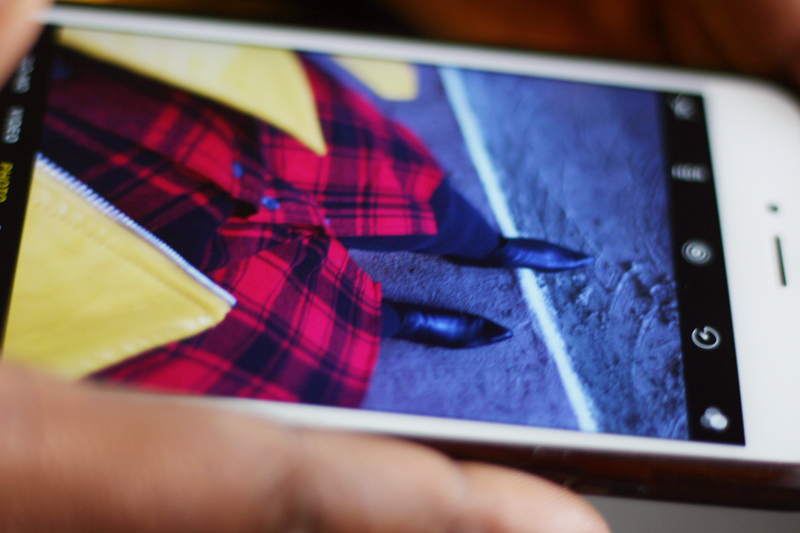 That’s basically what this look embodies (check out this post for how to dress for travel). 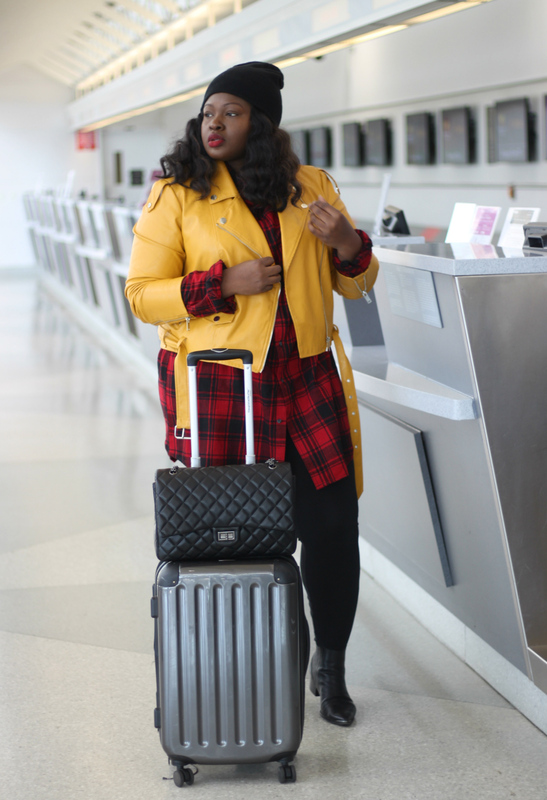 I was originally gonna title this most ketchup and mustard, the focal point of this look is this oversized men’s plaid shirt I picked up from Walmart it essentially fits like a shirt dress, because its cold out I decided to pair the look with leggings (get one of my favs here) instead of tights for additional warmth. For footwear I through on Chelsea boots which are perfect because they are pull-on and then I through on my cropped moto jacket and finally a warm beanie. 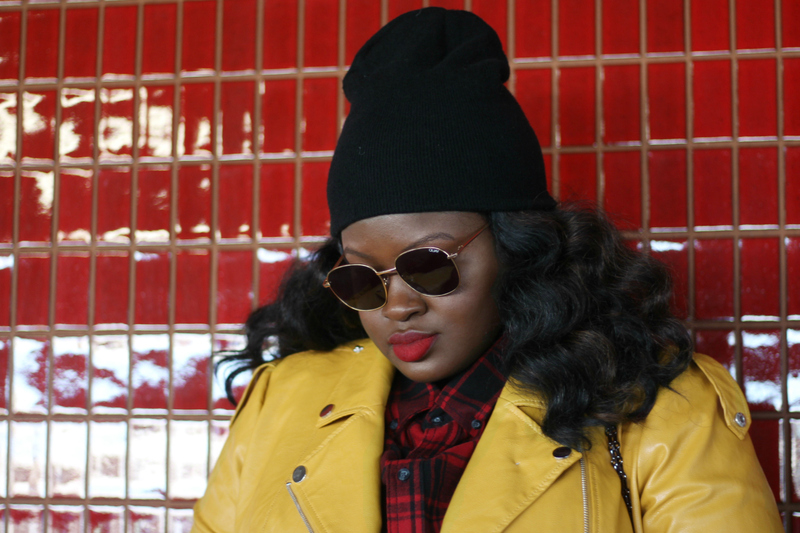 The jacket and the hat finish of the look and make it look put together but the oversized shirt and leggings bring back the comfort factor. What are your biggest travel mistakes? Add them to the list in the comments section below! 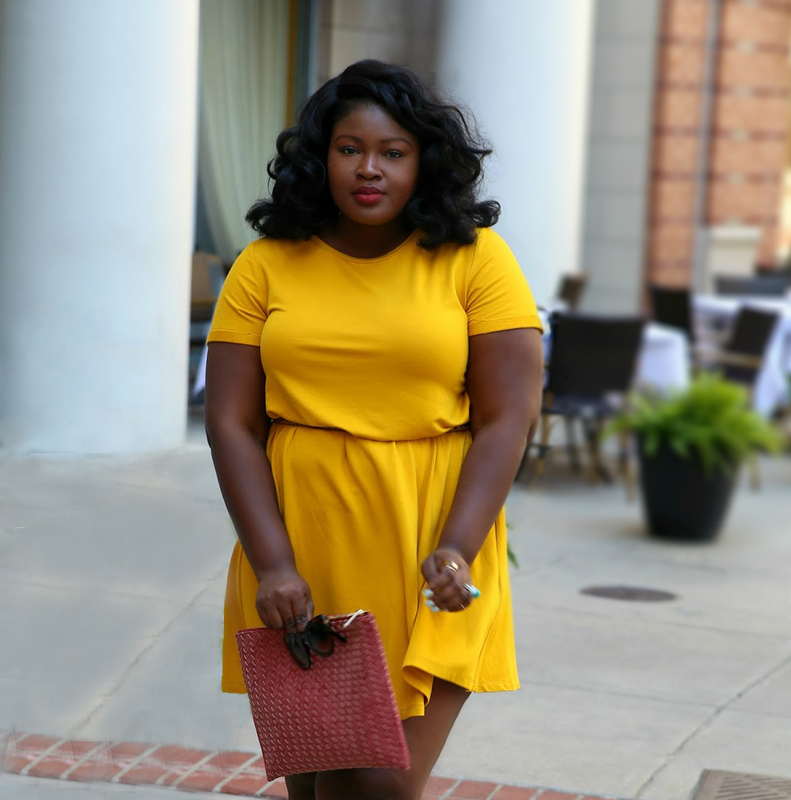 Next Post Every Thanksgiving Outfit Needs This!